It doesn't matter what bad habit or addictive pattern you have - this hypnosis MP3 will give you the power to stop it! Helps Stop All Types of Bad Habits & Unhealthy Patterns! Different to an addiction, a bad habit is primarily a mental pattern that makes you do something all the time that you know you shouldn't. There is no brain chemical changes for a bad habit, only habitual patterns that are usually existent at a subconscious level. 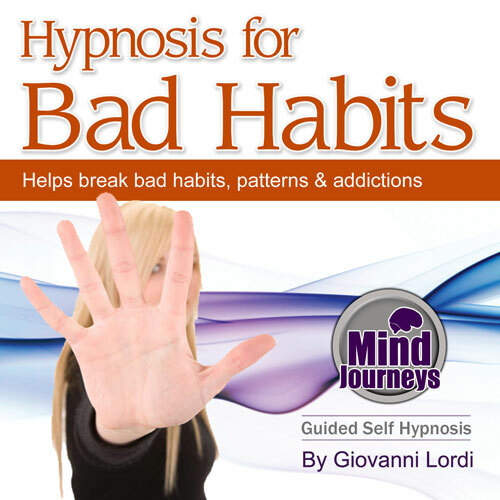 In this particular program Giovanni uses hypnosis to help connect you with your subconscious and override the processes causing the habit. Doing this is the most effective to properly overcome a bad habit because it addresses the source of the issue rather then just covering it up temporarily. The Bad Habit hypnosis session can be used for any type of habit like chewing fingernails, excessive shopping, spitting in public, impulse buying, eating when bored, compulsive lying, cheating etc. It is effective for all habits because Giovanni uses techniques to address the fundamental cause & response mechanisms behind every type of negative consequence habitual behavior. If you or someone you know has identified that you have a bad habit and that you need to fix it which is why you are reading this page - please know you have already made the most important step. "Harmony, balance, positive thought, positive actions, free from unwanted habits, fee from unwanted patterns, free from associations, clean environment, positive emotions, positive thoughts"